Register by July 26th to guarantee a t-shirt. Shirts for those that register after July 26 will only be available on a first come, first served basis. Register online through noon on July 30th. Register race day beginning at 7:00pm. 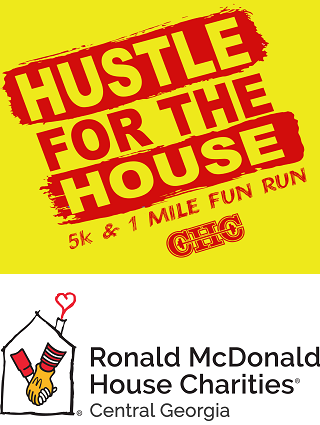 Join us on Friday, August 3rd, for the Hustle for the House 5K and 1 Mile Fun Run benefiting Ronald McDonald House Charities (RMHC) of Central Georgia. The race will be at Southern Pines Recreation Complex in Dublin, GA. All participants are encouraged to come in as much glow attire as possible. Some prizes will be awarded for glow participation! We will have music for everyone to enjoy for some glow dancing. We want this to be a fun, family event! Please note that we are adding Kanoa's Kupboard to this event. Each person that brings in 3 items from the wish list will receive a ticket to be entered into a drawing for some great prizes!!! For more information, please contact Clarks Health Club at 478-272-8866 or clarkshealthclub2002@hotmail.com.